HEARTHSTONE! There’s a reason why Hearthstone is so popular, and that’s because the game is a perfect blend of being easy to learn, and damn challenging to master. It’s also bloody massive these days, with tournaments popping up everywhere, and players throwing down cards in an attempt to be number one. It’s also the kind of game that is more vulnerable than my emotional core after I weigh myself at gym, because it happens to be especially open to DDOS attacks. According to the Daily Dot, Hearthstone suffered not one, not two but three attacks over the weekend in various tournaments. Hearthstats Challenger League, the ESL and Kinguin Winter all suffered some denial of service as players, broadcasters and organisers suffered the wrath of what is most likely some horrid little collective of trolls. I’m trying to work out what the collective noun is here, but I’m going to go with a tosspot of trolls. Friday saw Hearthstats suffer from connection problems as hackers went after the third and fourth matches of the challenger league tournament, eventually resulting in those matches having to be completed offline. Saturday saw the Kinguin For Charity event interrupted and postponed, while the ESL King Of The Hill tournament also suffered similar attacks. 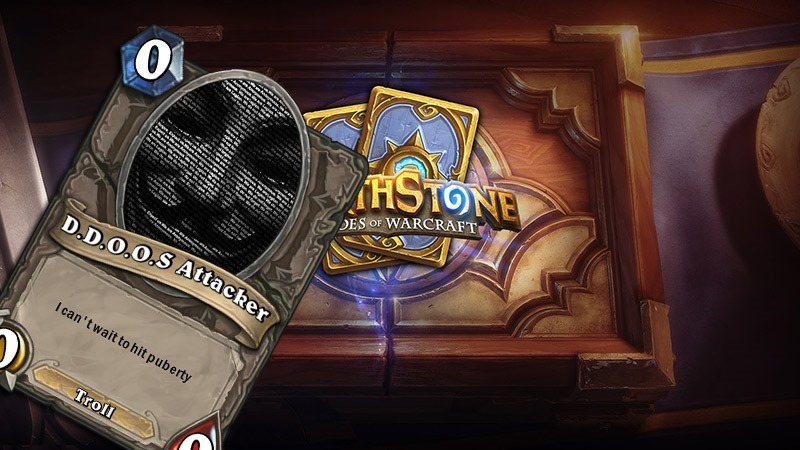 It’s not only a kak weekend for the Hearthstone scene in general, but most likely a taste of what’s to come, as most competitive games use a similar structure of online parties sharing a n online connection these days, to battle it out. Time to bust out the LAN cables again then. And maybe Quake 3 Arena. Yes, let’s see them dox DDOS that game. Next article What is it like to be Ciri in The Witcher 3?